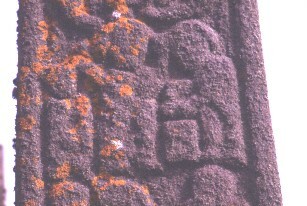 W5 central figure "wig" like hair carries sword on right shoulder, touches figure on right with his left hand, between them is a rectangular shape (altar?) smaller figure fills space on left. Sacrifice of Isaac. Old Testament. Gen. 22:7.